Here, from the Mid-Atlantic. up to the Northern reaches of the East Coast of the United States, winter frostbiting wraps up usually by mid March. 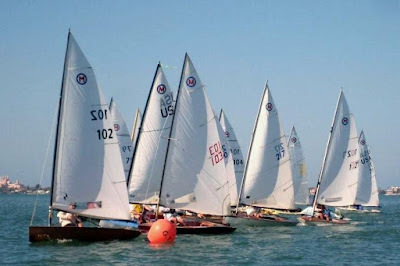 In recognition of those hardy souls (Tillerman, JohnZ, Dr. John) thrashing around in dinghies on Sundays, in water just above freezing, here is a video of the Laser frostbiting fleet in Newport RI (I think this may be Tillerman's frostbite fleet). Frostbiting from Brooks Canaday on Vimeo. I wrote about River Sailing about a year ago. I also post regularly on scows. 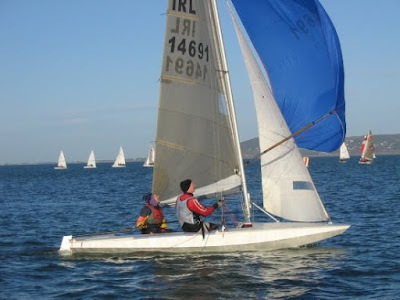 In a pleasant juxtaposition, here are two videos featuring narrow water sailing in two very different traditional scow types. The first is a short video of a camp-cruise somewhere on the rivers of Holland. Of interest is the pram bowed, open decked, sloop rig, double leeboard craft these lads are sailing. 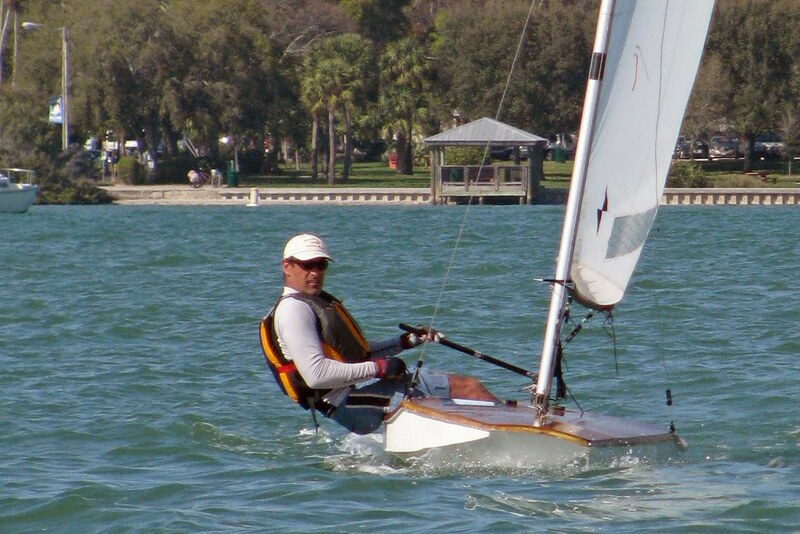 Looks to be a very capable dinghy cruiser for small water. Anyone out there in the bloggoshpere have anything to add on the design and make of this traditional Dutch sailboat? 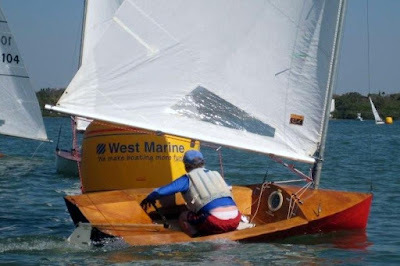 Reader JotM came back with an answer in a flash.... pulling his comment over to the front page "The boat in the first clip is a "Lelieschouw", the first one-design in use with the Dutch Sea Scouts. The first one was commissioned in 1949. In 1955 it's successor, the "Lelievlet" was introduced. While only about 80 of the first were build there are now about 1600 of the latter. Both are just about indestructible. TOH to reader JotM for the insight! And another video on a small water sailboat I've already featured in this blog; the traditional Brigham scow sailing on the impossibly narrow River Hull. Well, lets go to the six degress of separation, Bob Brannan's dad (Bob Brannan of the of the 60th birthday party) owned a house on Green Street. In the 70's Bob Turner rented a room at that Green Street house with, I think it was his first wife, but it may have been a girlfriend, and the story goes that, way back then, at 6 am there was a huge crash that woke up all boarders asleep in that Green Street house. Bob Turner's wife/girlfriend, had embraced Yoga way before it became fashionable, and was wont to perform headstands early in the morning. That morning, she had fallen asleep in the headstand and in her collapse to the floor, had taken out a lamp and and some shelving. 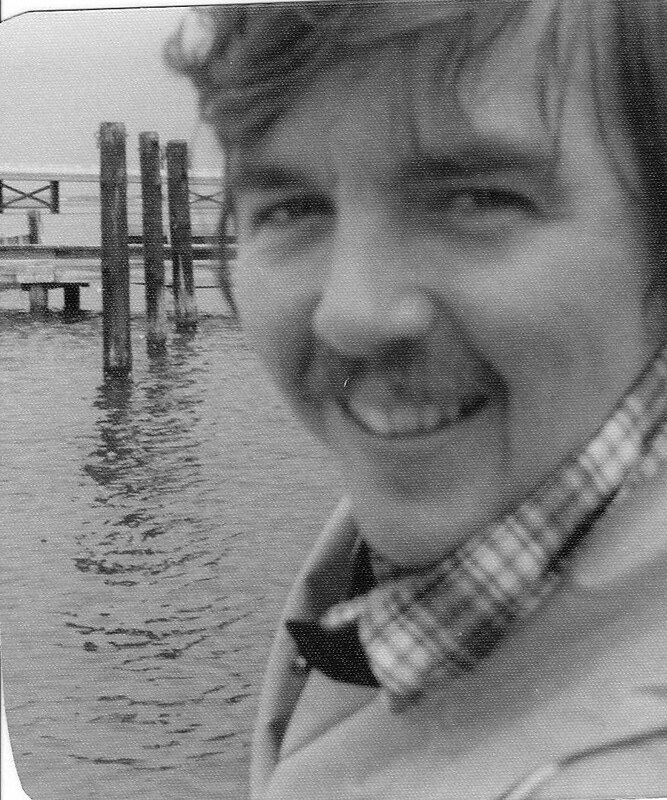 Bob Turner can weave a sea story with the best of them. Hmm! I wonder if he has had a 60th birthday party yet? Music Whenever; Little Feat "Fat Man in the Bathtub"
It might be old-fartism shining through, but you just gotta give credit to those special bands from the 60's and 70's. Opps! Original video went away. Here is an odd video, where the music of Little Feat is set to a women's choreographed dance team. I attended my first 60th birthday party of one of my friends. I have plenty of friends that are over 60 years in age, but all of them, being the humble sort, declined to have a party to mark that milestone. It seems the wives are the ones that feel there should be a need to throw a party for this occasion (which is perfectly fine as I run into Bob very infrequently and I need a party to sit down and catch up). Well, Bob Brannan, had his 60th party last weekend. We met in our 20's, the age when most friendships that sprout seem to last over a lifetime. 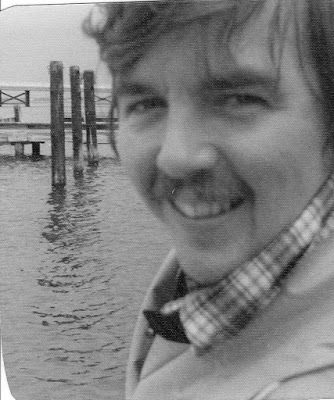 We lived in the same batchelor house, caroused in Eastport, swilled the pitchers of beer at Marmaduke's and we sailed dinghies together... not constantly; Bob was usually the skilled pickup crew you got at the last minute. We did enough regattas to have accumulated those shared sea stories we tell over and over again when we get together. 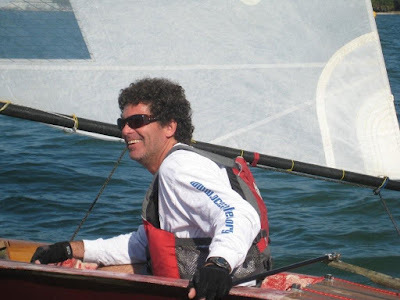 Bob crewed with me in the International 14 (way back when I sailed doublehanders) There was one memorable Essex, Connecticut Regatta with numerous disasters in the blue Kirby V "Babe, the Blue Ox" (which became "Life during Wartime" with a subsequent owner). I digress. The only photos I can find of Bob is when we did the first Tasar regatta held in North America. Late 1970's and what I remember is Frank Bethawaite doing a clinic in the morning (the regatta was out of Mantoloking YC, Barnegat Bay, NJ) where he went into carefully trimming the main so the twist would get all the telltales streaming. 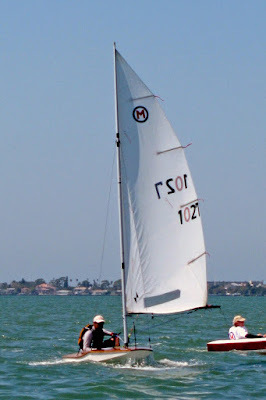 We promptly went out in the 8-10 knot breeze and found that you went higher and faster if you just sheeted the main really tight and never, ever looked up at the telltales. Bob Brannan and Tom Price go all the way, I mean all the way back to fourth grade. Now those two can tell some stories. I'll see if I can get one to write at least one of them up. Bob, Congrats on the 60th ! For many years, spring was not a season to do boat work, but a season to watch my two daughters play lacrosse. Those daughters have grown into adult women and that season has passed, but I still catch high school lacrosse with the Wheaton High School (Maryland) girls team. Lacrosse in America has always been the sport of white suburbia but in Wheaton High School, most of the team is composed of immigrant teens (children of all those invisible workers that make Washington DC operate), many are picking up lacrosse sticks for the first time in freshman year. To them, this is a very alien sport that must be learned from the ground up. The games against those richer, whiter schools in North County can be very dispiriting blow outs. But the effort is always there, the competitive drive never wavers. For some reason, Montgomery County Public Schools, decided to make a video featuring Wheaton High School Lacrosse. They could have featured one of the schools with a top notch record but someone decided they would feature a team with multiple nationalities, a team that, at times, features more enthusiasm than skill. Go Wheaton Knights and Coach Lauren Z, Coach Kari Tracey! Music Whenever; Rupa and The April Fishes; "Une Américaine à Paris"
This music video initially caught my eye with it's dissolute bar scene and bouncy cabaret music, despite the French lyrics making no sense (other than the words 'American' and 'San Francisco'.....I am unfortunately a typical Yankee monoglot). But to me the French language has a pleasing sound and songs sung in French convey a certain romantic mysticism. Rupa Marya was born in America but spent part of her childhood growing up in France. Rupa & The April Fishes Cinematography By: MYRiCK Dir.Dugan O. from David Myrick on Vimeo. 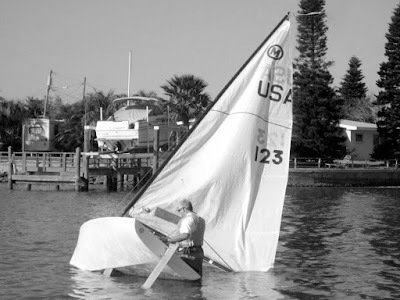 This amusing video, taken during an intercollegiate regatta, appeared not quite a year ago over at Sailgroove.org . It shows the crew hiking inverted; his torso in the boat, feet hanging over the side, while he frantically bails out his 420. I've been somewhat tardy on posting the 2011 Midwinter results. Here are the top twelve positions. 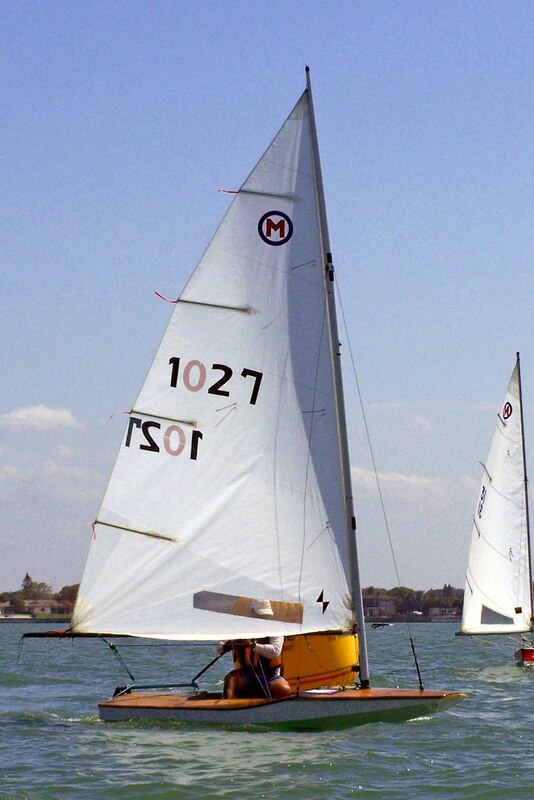 Jeff had to dig himself back in a couple of races where he didn't lead from the start, but for the most part he was leading from the first weather mark on (the RAF was when he realized he had sailed the wrong course). 2011 Classic Moth Midwinters; Those Cheeky Bastards, Another Frankenboat! My post about Classic Mothists converting Lasers to Moths elicited from the blogshpere either horror, bemusement, or a "Wow, that's kind of neat" (the latter comment mostly found among fellow Classic Mothists). And then at the 2010 Classic Moth Nationals, Len Parker did another Frankenboat, a MiniFish conversion to a Classic Moth. After all this, I was wondering what the class could do for an encore. Turns out, I didn't have to worry. 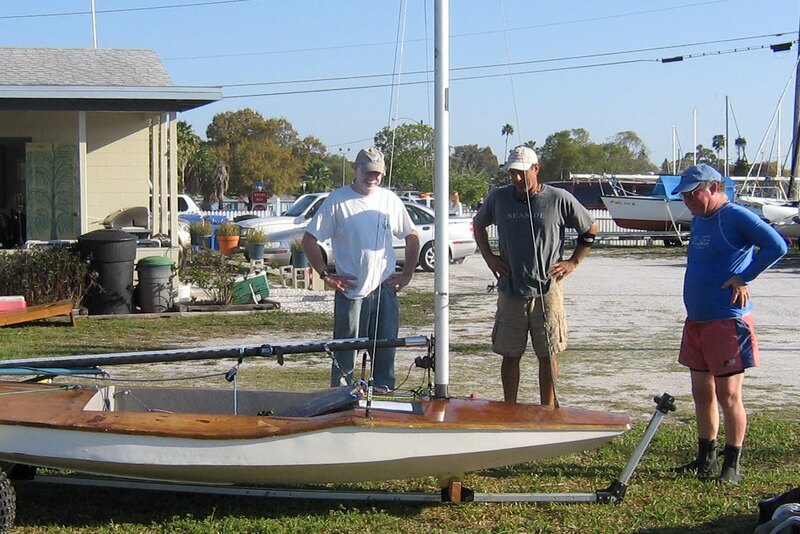 Patrick Burger showed up at the Gulfport Midwinters with a Classic Moth that he had hacked out of an older wooden Fireball hull. 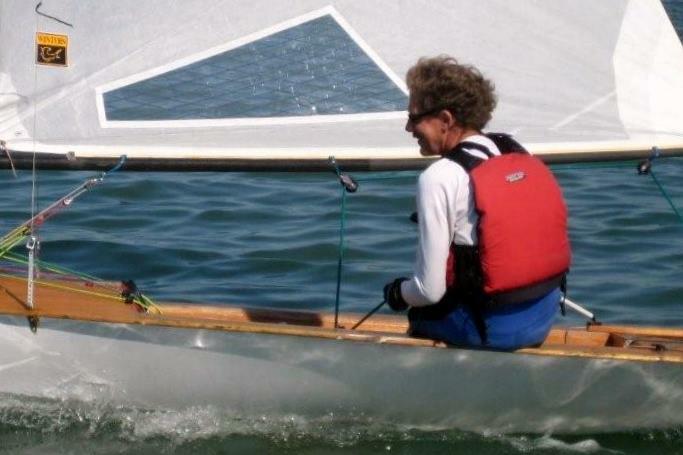 Leaving the Fireball bow intact, Patrick had chopped the back 5 feet off, bent the topsides in so he could use the existing Fireball transom, took the bubble foredeck off and redecked it flat (unfortunately in 1/4" ply so it was heavy), and added a 1/2 deck around the daggerboard trunk. Patrick recycled damn near everything; the daggerboard and rudder were from the original Fireball, the mast from the original Fireball, and the dolly from the original Fireball. 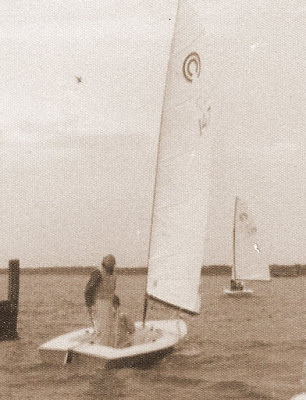 For the regatta, Patrick didn't have much success racing it as a Classic Moth; the Mothball was too blunt, with too short a waterline, and, in 1/4 inch ply, too heavy, but it was a very credible sailing dinghy. 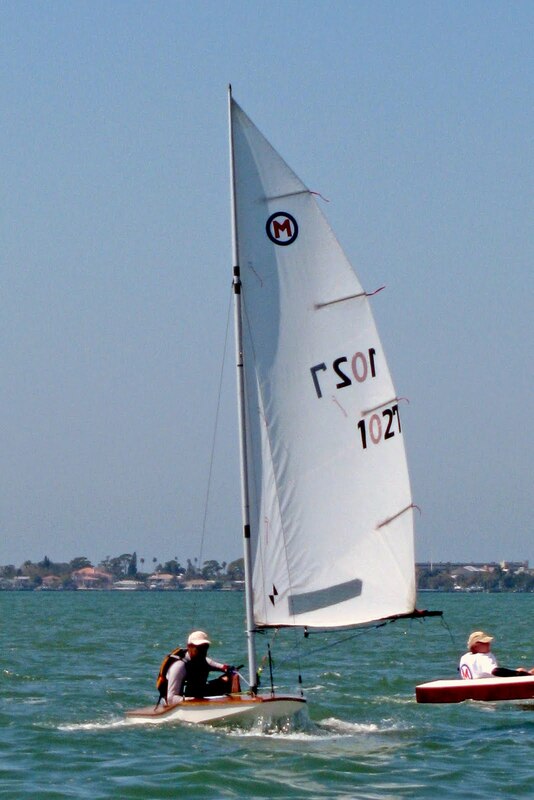 Patrick took it out for a test sail on a breezy Friday and had a great time blasting back and forth. Sometimes the creativity in this Classic Moth crowd just blows me away! The following pics were taken by John Z, Amy Linton, and Elisabeth Albaugh. As an aside, Patrick did walk away with an award at the Midwinters. He copped himself the "Persistence Award"; awarded to the person with the worst overall result after finishing all the races. Don't snicker, your blogmeister is a previous recipient of this award which remains prominently displayed to this very day! 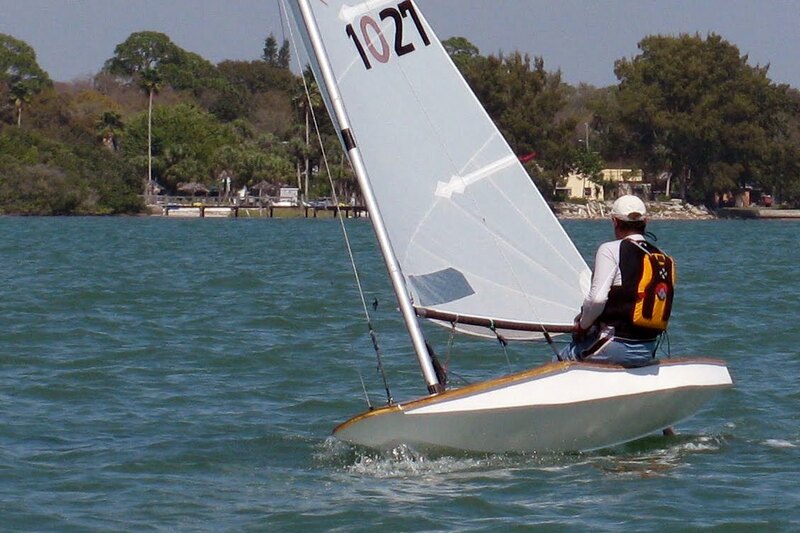 Last weekend, Mothboat regatta road trip partner John Z and I were down at Gulfport YC, St. Pete, Florida for the Classic Mothboat Midwinters. Suffice to say that, after years of traveling thousands of miles up and down I-95 to sail the midwinters in 40-50 degree F temperatures , this year we were treated to both Saturday and Sunday temps in the high 70's to just scratching the 80's. After a chilly December, January, and February in the Mid-Atlantic, this was a much welcome change. Sixteen Mothboats sailed eleven races in lightish winds (I think I got serious in the hiking straps for a minute or two the whole series). 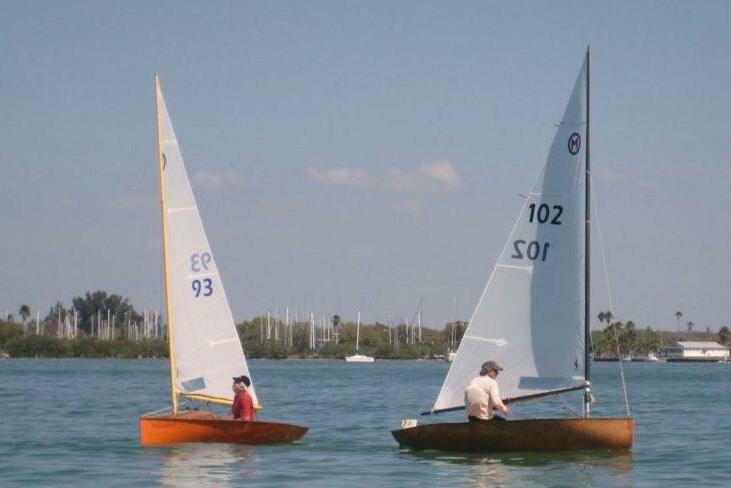 A great series, both on and off the water. I'll post some teaser pictures now and post a more detailed report later. Longtime Mothist, George Albaugh, in his blog "Mid-Atlantic Musings", has weighed in with his first post up on the Midwinters. You can jump to his article HERE . First, acknowledgements to the photographers. On shore photos are from Bob Patterson and the on the water photos are from Amy Parker. Again, click on the picture to get a higher resolution image.